Supporters of Ballot Measure 11 claim that the reform has served as a cost-effective crime control strategy. Yet a comparison of crime patterns and incarceration rates in Oregon with patterns in other states shows that remarkable reductions in crime rates have occurred elsewhere without recourse to a huge and costly expansion of prison capacity. 1994 was a seismic year for the US criminal justice system. Congressional enactment of the Violent Crime Control and Law Enforcement Act spurred many states to stiffen penalties for people convicted of crime. That same year Oregon voters passed Ballot Measure 11, creating sharply increased sentences for nearly two dozen violent offenses. Many of its supporters argue that Measure 11 has made a substantial contribution to the decrease in Oregon's violent crime rate since 1995, serving as a cost-effective crime control strategy. 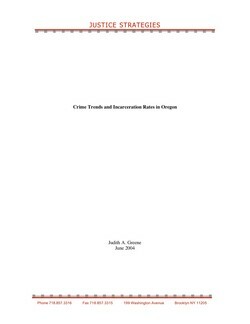 Yet a comparison of crime patterns and incarceration rates in Oregon with patterns in other key states shows that remarkable reductions in crime rates have occurred elsewhere without recourse to a huge and costly expansion of prison capacity. Moreover, recent research on deterrence and incapacitation does not provide support for the notion that longer sentences reduce crime rates.